The Chola dynasty wis ane o the langest-rulin dynasties in the history o soothren Indie. The earliest datable references tae this Tamil dynasty are in inscriptions frae the 3rd century BCE left bi Ashoka, o the Maurya Empire. 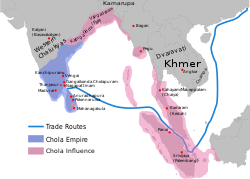 As ane o the Three Crouned Keengs o Tamilakam, the dynasty continued tae govren ower varyin territory till the 13t century CE.